Accurate prediction of flood inundation area and hydraulics requires knowledge of channel characteristics such as cross-sectional area, shape and individual roughness elements (e.g. boulders). The resistance exerted by the channel and its characteristics govern: local, cross-sectional and reach scale hydraulics. Channel characteristics and consequent flow conditions during floods can be altered considerably by the introduction of floating debris and sediment, thereby increasing flood risk. 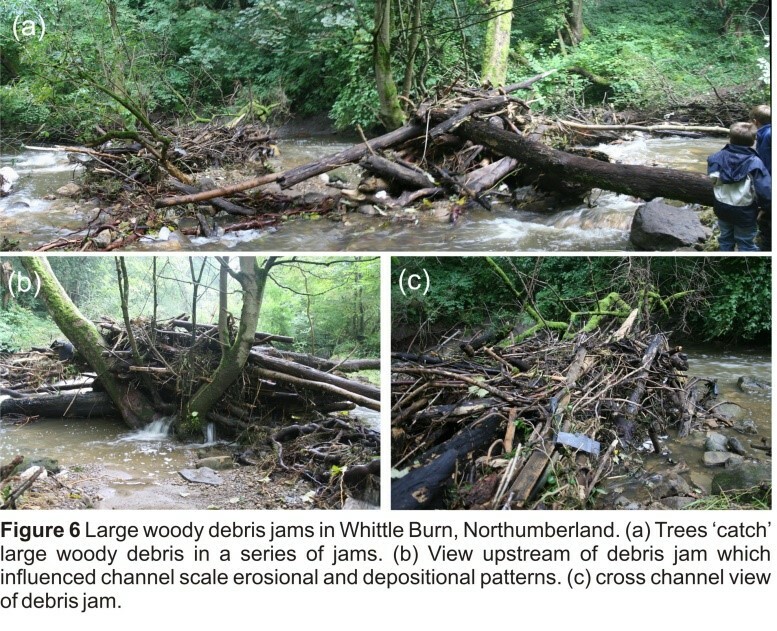 Record breaking floods in Northumberland and Cumbria in 2008 and 2009 respectively, provide insights into the role that woody debris plays in altering flow conditions and consequent channel morphology. Floating debris is introduced to river channels either by entrainment from within the river channel and river corridor/flood plain or by hillslope failure (Fig. 1). 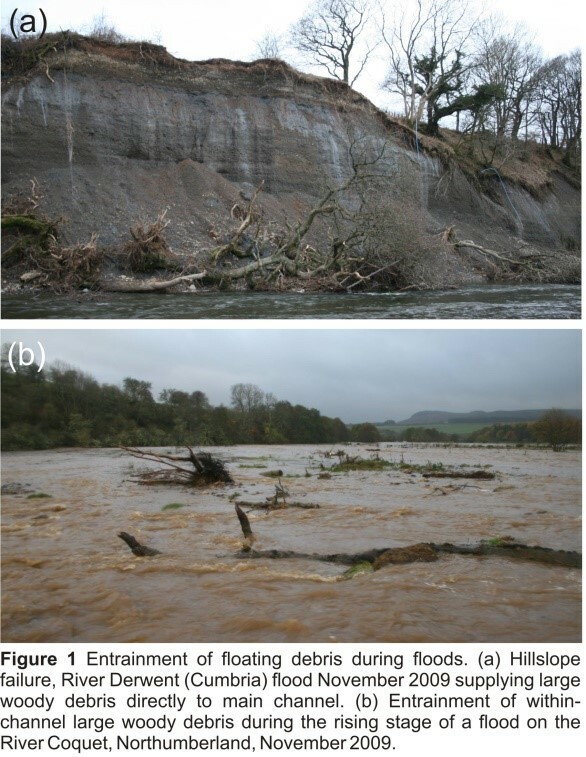 Timing of introduction of floating debris to a flood may be controlled by the exceedance of critical thresholds for debris entrainment via flotation or river bank and hillslope failure. 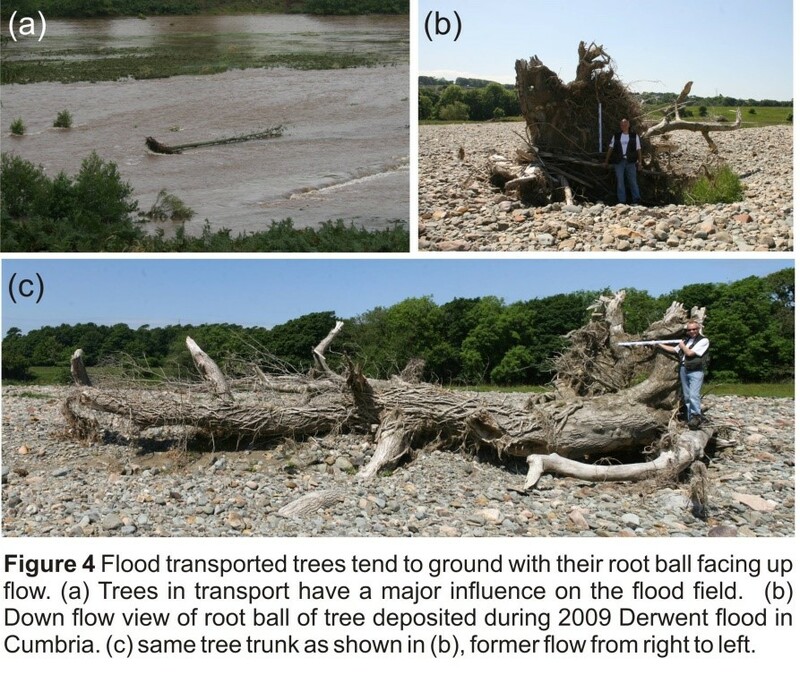 During the September 2008 Coquet River woody debris was entrained and transported during the flood peak and waning stage suggesting the operation of thresholds for entrainment at higher discharges (Fig. 2). Note that debris mantles fence lines providing much greater resistance to waning stage flood flows than on rising stage. 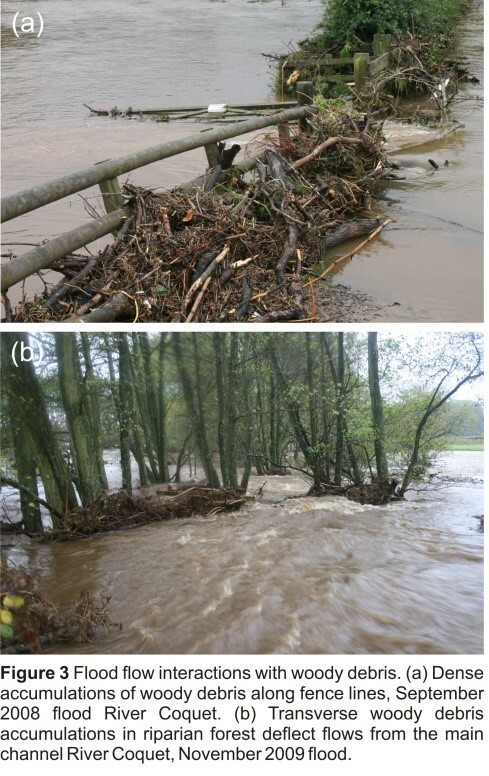 Woody debris accumulations along fence-lines and between riparian vegetation can deflect flow and cause localised backwater effects raising local water levels (Fig. 3). Flood transported trees tend to be transported with their roots facing up flow thereby minimising their resistance to flow (Fig. 4). Isolated grounded large woody debris can act as major obstacles to the flow resulting in classic obstacle marks characterised by proximal scour hollows and distal ‘tails’ of sediment in the their lee (Fig. 5). Large debris accumulations can also result in flood flow deflection producing localised zones of lateral river bank erosion (Fig. 5). Floods within high gradient streams can produce very large debris dams (Fig. 6). These accumulations often mimic the step and pool morphology of high gradient stream channels. Large trees act as log catchers preventing large woody debris travelling downstream and clogging-up bridges. 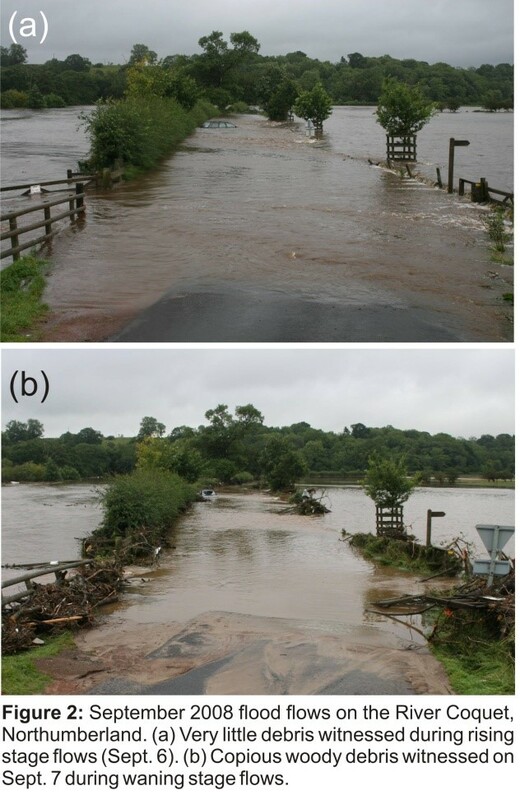 In some instances modern bridge design is less effective in allowing the passage of large woody debris and sediment than earlier designs (Fig. 7a). 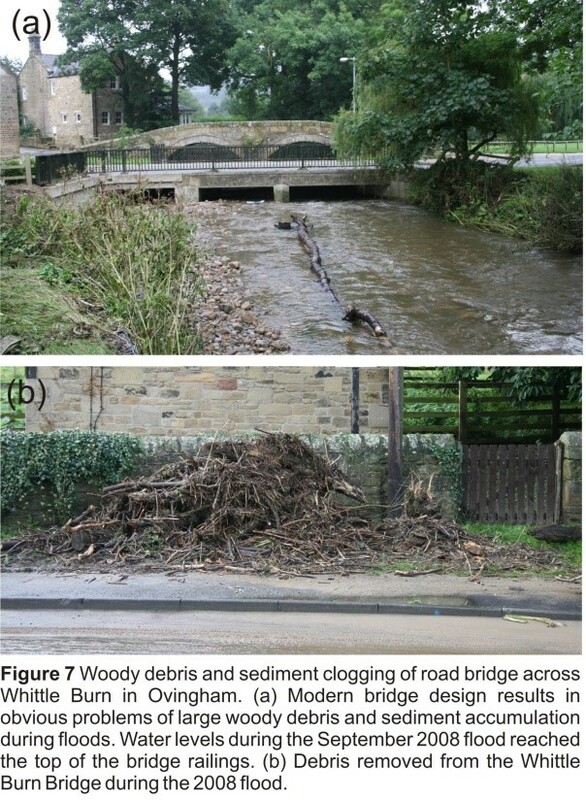 In many cases large volumes of woody debris are removed from bridges and other structures during floods (Fig. 7b). Although such interventions are likely to be crucial to reduce flood risk in the vicinity, their role is seldom considered by hydrologists and hydraulic modellers in the aftermath of specific flood events. 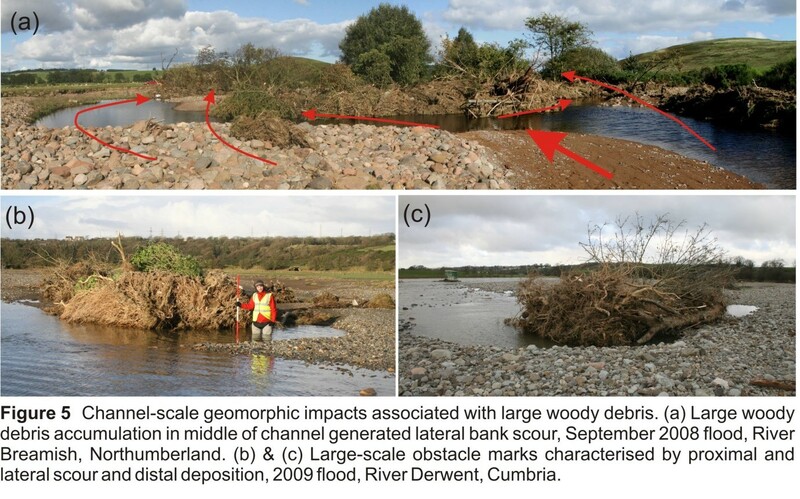 It is clear that the woody debris exerts a major influence on flood flow dynamics and geomorphological impact. As such it is crucial to consider how and when woody debris is introduced to flood flows as well as the impacts of transient and grounded debris on flood hydraulics. This entry was posted in Uncategorized on May 28, 2015 by Rob Thompson.